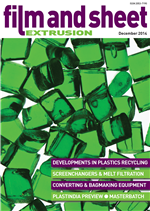 The December 2014 edition of Film and Sheet Extrusion is now available for viewing. Just click here to see the magazine in full, completely free of charge. What's new in bag-making and converting equipment?